Police in Keene, New Hampshire, are paying a woman a few hundred dollars after smashing her car window. The officer thought he was rescuing a baby locked in a hot car, but it wasn't what it seemed. On a sweltering Saturday afternoon in late July, Keene Police say three shoppers in the Wal-Mart plaza called 911. "We're parked next to a Ford, and there's a baby left in the car," said one of the callers. Lt. Shane Maxfield said the first officer on scene saw a baby's legs sticking out from under a blanket in a car seat. So, he shattered the car window to get inside. "It looked like a baby, it felt like a baby, the arms were springing the way baby arms sometimes do, and so he started doing baby CPR," Lt. Maxfield said. 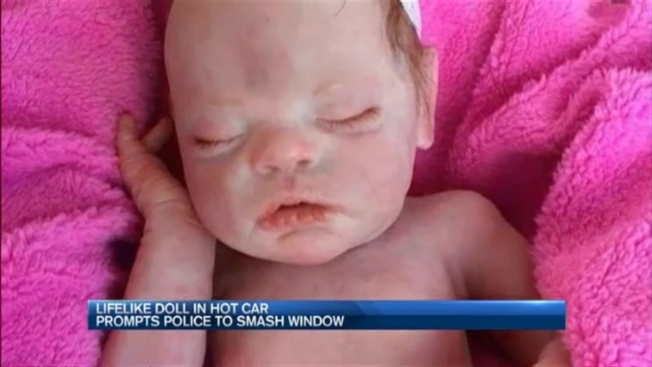 When the officer saw that the child had no airway and no ear canals, he realized it was a doll. A very expensive, life-like doll. "Between $2,000 and $3,000 for this thing," Lt. Maxfield said. "Its manufactured with the intent to be indistinguishable from a regular baby." The one in the car was "Ainsley" — one of 40 reborns in Carolynne Seiffert's collection. The Vermont resident didn't want to be interviewed, but told us after the tragic death of her son ten years ago, the dolls have helped her cope. Lt. Maxfield said it's the most unusual turn of events he's ever seen, but that first responders did exactly the right thing. "If you make a mistake the other way then maybe a baby is dead," Lt. Maxfield said. Police have agreed to pay Seiffert $300 for damage to her vehicle. In return, Seiffert will be putting a sticker on her vehicle warning people of her lifelike dolls.